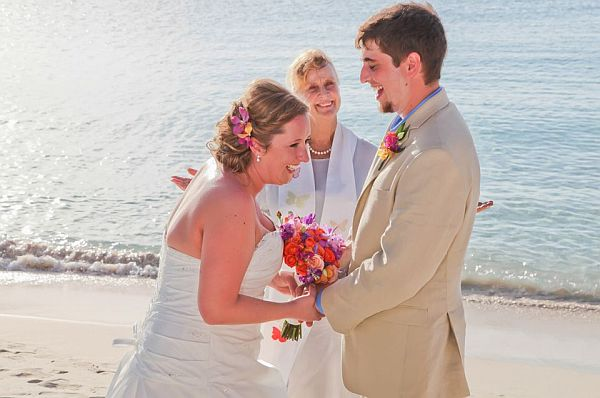 All of your hard work and great communication made the whole wedding experience so smooth and worry-free. 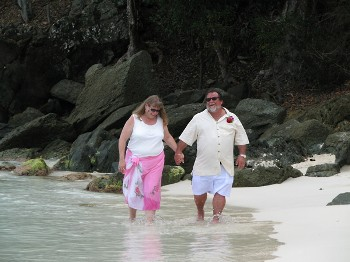 We loved Cinnamon Bay Beach and can’t wait to get back to the USVI. “Words cannot express how good we still feel that you married us….your words were thoughtful, your grace calming, and you created a peaceful space in both place and time to reflect and enjoy this great step together….we thank you and we will never forget you. We were reminded of you tonight when WE SAW YOU ON THE TRAVEL CHANNEL! I just happened to flip to the Travel Channel and there you were performing a wedding! 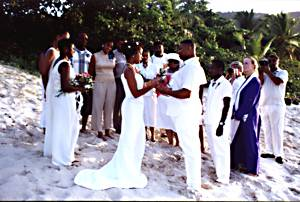 Anyway, thank you again for the wonderful service you blessed us with at Hawk’s Nest Beach. We have struggled to find adequate words to express our gratitude for everything: for getting to know us ahead of time, for taking the time to help us explore what we wanted, and for making our ceremony personal, meaningful and spiritual. We felt a deep connection to you, to the earth, to the universe, and, most importantly to each other. We vow to do our best to follow your advice and wisdom to honor each other and be kind to each other all the days of our lives. 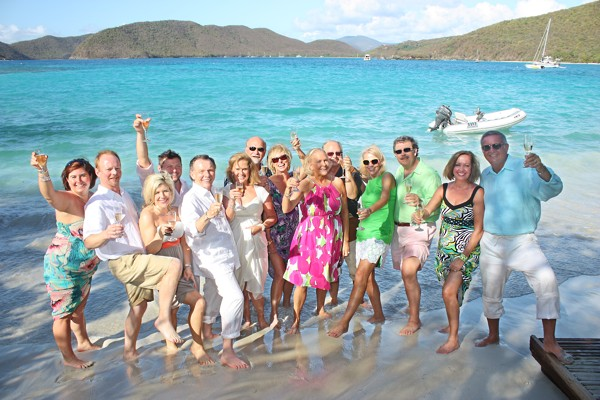 We have fallen in love with St. John and hope to visit again and again. I wanted to THANK YOU from both Eddie and myself for conducting the most beautiful wedding ceremony for us on June 5, 2013. Your help beforehand whenever I had a question really made me feel at ease that everything would go smoothly….and it did! You made our day even better with your beautiful words and calm and loving presence. I am so very thankful that you were available to marry us on our special day. 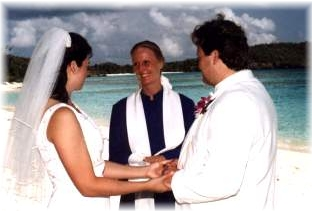 Michelle and I just wanted to drop you a note to let you know that it has been 12 years since you married us on Cinnamon Bay Beach. We are going strong, loving life and our wonderful 10 year old son. Thank you! 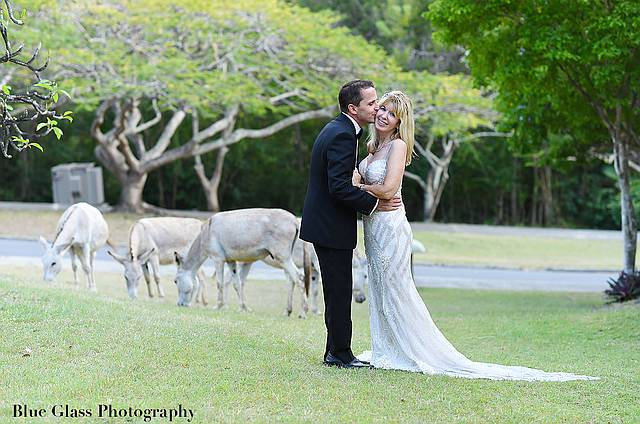 ” I am still on cloud nine and Marcus and I can’t thank you enough for being such a special part of our day. It was exactly what we wanted. “When Dave and I came to St John via Windjammer cruises, as you said you would, you met us at the dock and immediately put us at ease. We had been somewhat stressed by the wedding plans made with someone we had never met. 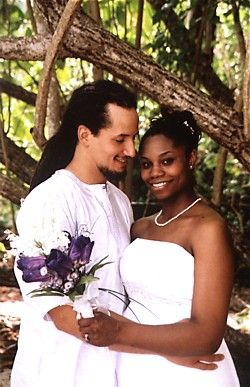 You had also called us back promptly more than once when we called you from the states in a panic over some question we forgot to ask.The trip to the courthouse in St Thomas to get our marriage license went exactly as you told us it would.For all of this, we are so thankful to you. 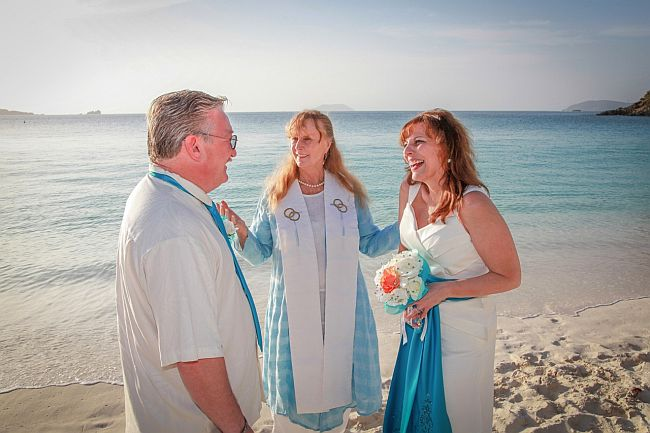 We got married on Hawknest Beach and it was absolutely breathtaking and we thought the Island Beach ceremony was beautiful.We could not have asked for a lovelier spot in which to get married or a more beautiful service. 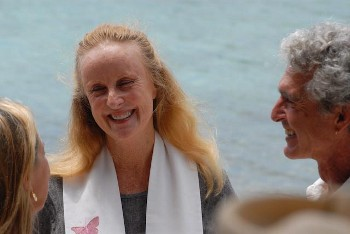 We came to the island by ourselves to get married but never would we have believed that we would leave feeling as if we had had a dear friend performing the ceremony. You truly have a calling for the services you perform and the gift of yourself you gave to us was more than we could ever have expected. Saying thank you hardly touches on our gratitude. You made our wedding wonderful. Thank you so much for an incredible ceremony. The sincerity in your voice and words spoken brought tears to both our eyes. Though we had just met it felt as if a long time friend were marrying us. You were a tremendous help in planning a destination wedding all the way from New Jersey you helped me choose florists, photographer, reception area and bakery that were all nothing less than perfect thank you so much for your support. You are a bride to be’s dream come true. “it’s Erik & Cathy from Michigan. you married us almost 2 years ago at hawks’ nest beach and not a day goes by that I don’t think about that beautiful day you married me and my beautiful bride. so just thanks for being a very special part of the rest of our lives !!!!!!!!! “Although four months have gone by since you officiated at our wedding, we thank you from the bottom of our hearts for the most wonderful, meaningful and inspirational ceremony. Your warmth, spiritual wisdom, charisma, thoughtfulness and sincere words made it so special. “Hello. Wow, what an awesome ceremony!! You turned what could have been a very stressful day, into the most wonderful day ever! Scott and I were comparing notes after the wedding and decided if we could pick the perfect wedding it would be exactly how it turned out on Tuesday. Thank you for your kindness and thoughtfulness throughout everything. “We received the video of our marriage vow renewals today from Todd in the mail. We have watched it 3 times (so far!) Since our renewals in July, we have anxiously awaited the video. It is wonderful. We wanted to say that the main reason it was so great was due to the super job you did! Words cannot describe. You and the ceremony you performed were absolutely fantastic. Anne Marie, THANK YOU, so very much. We cannot wait to show our family and friends. We appreciate every word you said. You made it all so VERY special. “Firstly we would like to thank you for the lovely service that you performed at Hawksnest Bay which made our wedding day special. Yes, we did come a long way but it was worth it. 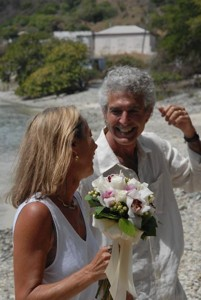 “Michael and I want to thank you for the beautiful wedding service you created for us on November 1st. It was the most glorious day in our new lives, and a wonderful beginning to have your words and blessings surround us and our dear friends, Lynette and Bill. 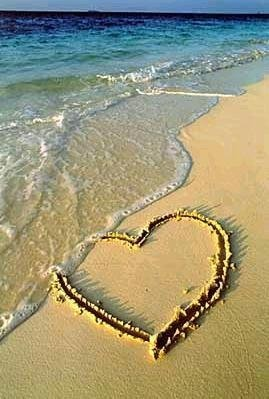 I knew the first moment I spoke with you that you understood the journey Michael and I had taken to reach our joining of lives as well as hearts. 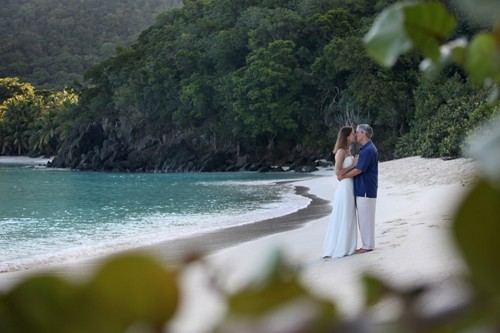 Having our wedding on St.John was just the best decision we have ever made. 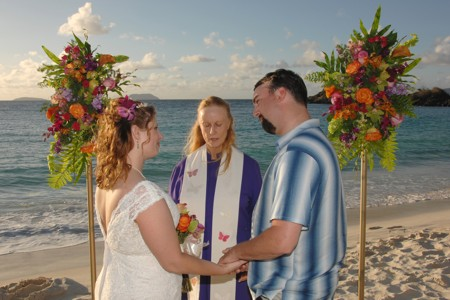 Randi and I were Married in a sunset ceremony on the Island of St. John by you. 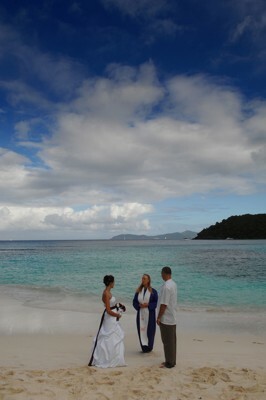 We wanted to thank you for all of your help in picking out the most beautiful place in the world to be wed. The ceremony was very touching and personal. You were terrific from the time we first spoke on the phone, meeting us at the ferry(with a taxi ready to transport us), to our wonderful beach wedding on Trunk Bay. You made the ceremony very touching and personal!! 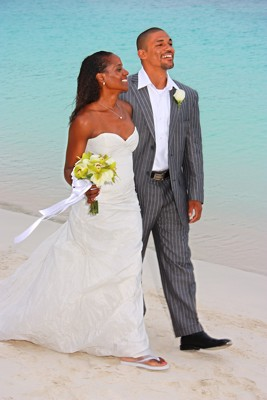 We just wanted to thank you for our beautiful morning wedding on Hawksnest beach. You made us feel so special even though we had never met prior to a just a few minutes before our wedding. 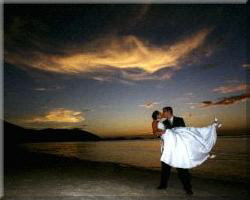 Your sincere love and joy for our union were palpable and it was just a beautiful moment in time there on the beach. I also want to thank you for all of your referrals and recommendations. It was a little daunting planning a wedding over the phone from so far away-but you were so helpful in helping me find just the right wedding site, photographer, florist, reception site and even a hairdresser! It was a perfect day and Brandon and I can’t wait to come back and have you renew our wedding vows someday! Thank you for such a memorable ceremony. The ceremony seemed to have touched everyone in the church that day. To us, it was heartwarming, caring, and made you think about your partner and commitments to them. I know we will never forget it. And I just wanted to say thank you for making our wedding day truly special. You have such a warm, wonderful spirit, and we are so happy we got to know you, both through our telephone calls and the wedding ceremony. You have certainly blessed us and our marriage. Thank you for making our wedding perfect. It was all about who we are. It was heartfelt and fun. 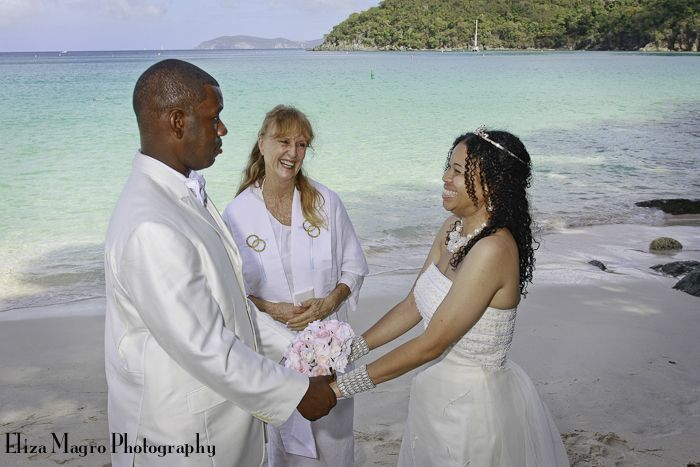 Thank you for making our wedding, as well as our trip to St. John, a memorable one. You are truly a magical woman, a gift from God. Our wedding was perfect, in every aspect. Anne Marie, a little over a year has passed since you took us under your wing and joined us in the most magical moment of our lives. 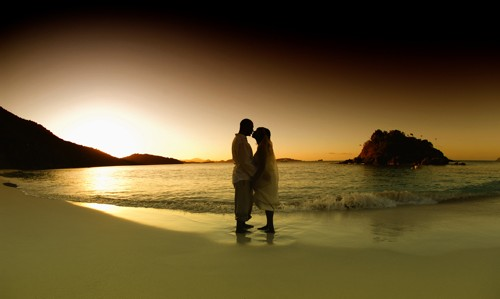 You soothed us with the advice to “spend a day relaxing at the beach and bath together in the sea. 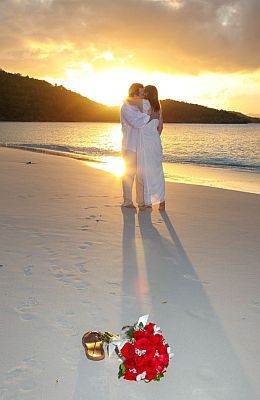 Then it was just us on Hawks Nest Beach with you, our vows and feelings so indescribable that it really was magical. We were wrapped up in our world of romance and at the same time truly had fun. Thank you so much for making our marriage so special. “I wanted to tell you again how wonderful the ceremony was. It was beyond my expectations. You did a great job and were sincere in all that you said“. 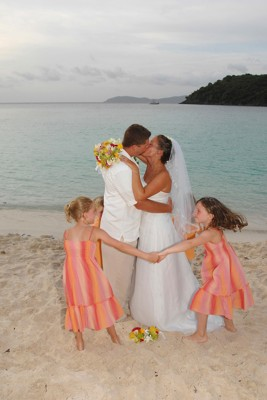 Having our wedding on St.John was just the best decision we have ever made. It didn’t take that much preparation for us, and you took care of all the paperwork, which gave us the chance to relax and enjoy the rest of our beautiful day! We loved the way you were so sweet and helpful to us all the time since Ray lives in N.Y. and I live in Holland, it made it a lot easier having everything done over the internet. Really, the ceremony you gave us was simply magical and so overwhelmingly beautiful, it was something we will never forget. Lots of love from a happily married couple!!!!!!!!!! We were so pleased with the beautiful ceremony that you performed for our kid’s wedding. Everything was so relaxed and we were truly able to enjoy the blessings that God was bestowing on this wedding couple. You made the experience so special and perfect! We feel like you knew exactly what was appropriate for the bride and groom. 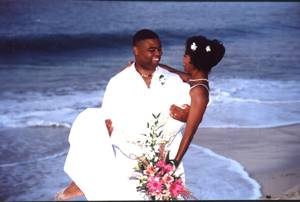 The warm soft sand, the gentle breeze, the waves rhythmically caressing the shore, the serenity and beauty of God’s creation… what a perfect setting for marriages! Our heartfelt thanks. “…….this was the feeling the whole time, laughter, fun, love, happiness, joy…..perfect! “We wanted to thank you for a wonderful ceremony. Your words were very meaningful, thoughtful and heart filled. If you want to get married in a meaningful way without a big production at a very reasonable price phone Anne Marie now at 340-626-4658. If you’re staying on St. Thomas, it’s a delightful 25-minute ferry ride to St. John. St. John has been Anne Marie’s home for over thirty-three years. She is an excellent resource for you to use. She will gladly share the information with you-best photographers, videographers, musicians, florists, caterers, and places to eat and stay….and snorkel. 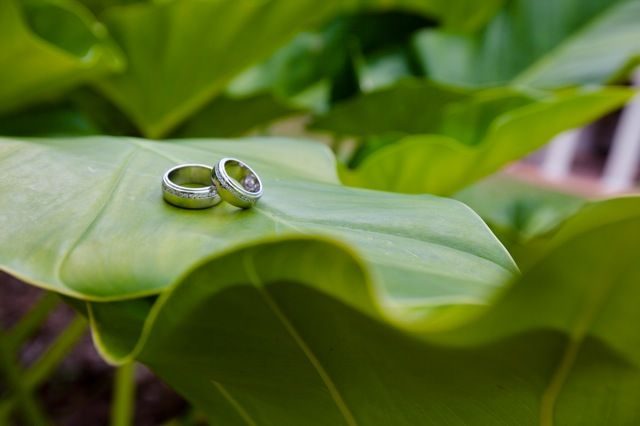 The fee of $400 includes all consultations, help with photographer, florist, videographer, musicians, caterers, restaurants, jeep rentals, accommodations, etc. A personalized marriage ceremony. 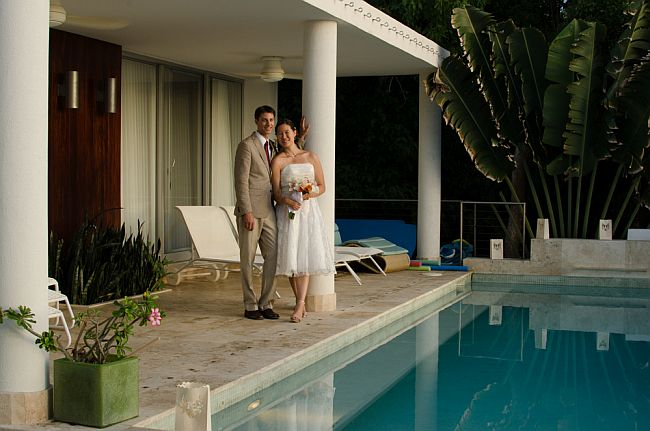 Anne Marie will suggest ideal locations depending on what time of year you will be here and time of day you want to get married. Anne Marie will file your certificate of marriage with Superior Court and mail you a certified copy. 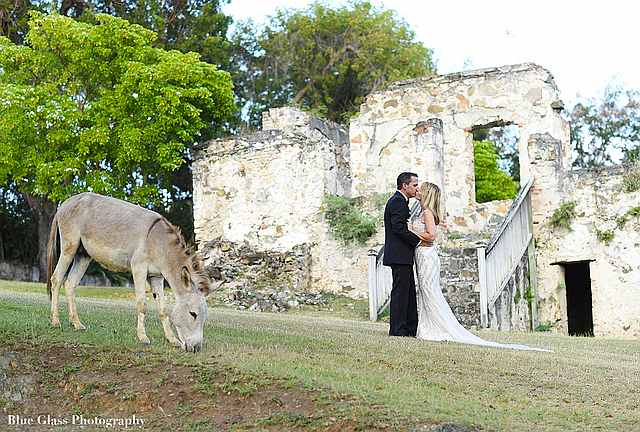 plan your Caribbean Destination wedding to St John.